I just received sad news that a friend and fellow collector Dennis Bowden passed away yesterday. Dennis was a wonderful man, deeply interested in fountain pens, their preservation, and their history. We traded information regularly and shared a keen interest in Kraker pens and their sometimes mysterious past. Dennis was always willing to answer a question or trade theories, without ever getting involved in arguments or conflicts that other collectors generated. He was always the voice of steady reason and just wanted to search out historical information, with the understanding that even if we never find all the facts, the hunt is the fun. His passing has saddened me, and maybe another collector had it right when he said ~ “these are just pens”. I looked through my repair queue today and found the perfect pen to restore today – a pen that Dennis would have liked – an early 20s Minnesota Pen Company – Winter Robbins. 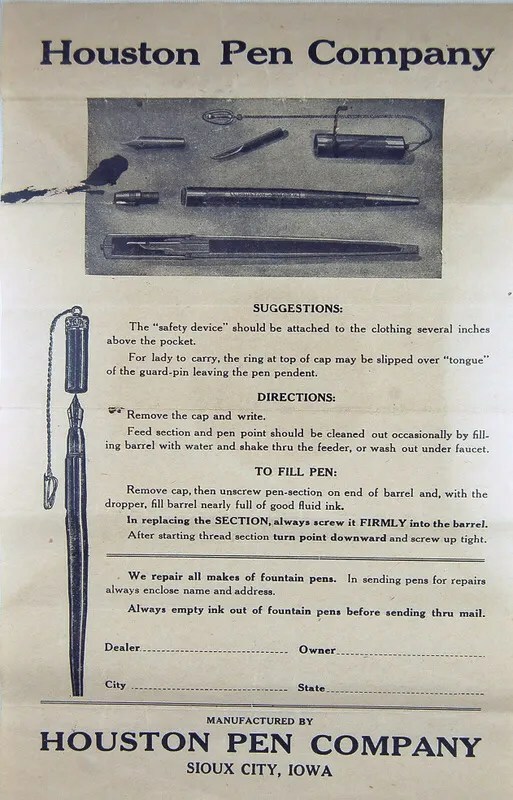 George M. Kraker and his Minnesota Pen Company produced these pens, presumably for the Winter – Robbins Stores. I recently ran into a Minneapolis / St. Paul pen expert who confirmed to me that Winter Robbins was a Twin Cities store. I have collected several of their pens over the years and I know that Dennis had a few as well. So Dennis, this one is for you. Here is a photo of the pen after I took it apart. It is a lever filler, using the distinctive Lotz lever, common to his early pens. As you can see, the old sac came out in just a few large pieces. As this is a BCHR (Black Chased Hard Rubber) pen, I kept all of the pieces away from its enemy – water. I scraped the section to remove all remnants of the old sac and adhesive. I also cleaned the feed gently with water and scraped the channels clear with an x-acto knife. I used metal polish on the Warranted No. 3 nib and it looks as good as new. Many of Kraker’s early Minnesota pens have cheap furniture, but the Winter Robbins pens often can be found with gold bands. This one has a very wide gold band that is clear, presumably engraving could have been included. The completed pen is below. It measures a long 5 9/16 inches capped and 6 3/4 inches posted and is quite wide as well. An additional photo of a Winter Robbins pen can be seen in my post dated December 7, 2007 – Hard Rubber Midwest Style. Several other posts relate to George Kraker and his pens and can be referenced by clicking on Kraker links in the Blogroll to the right of this post. 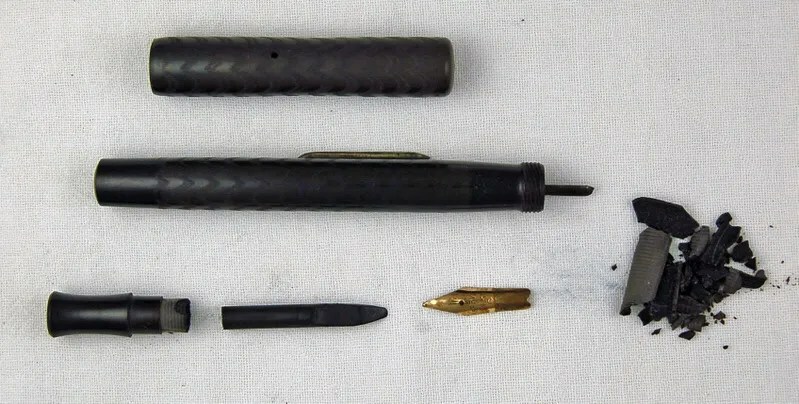 The only blemishes on this pen are the fact that the barrel has started to turn brown as these old hard rubber pens are prone to do, and there is a small chip on the reverse side of the cap, near the cap band. I filled the pen up with Sheaffer Peacock Blue and the pen writes well. I will use it for this week in memory of my friend. Webster pens were a brand sold through Sears stores and catalogs in the 1920s, 30s and 40s. 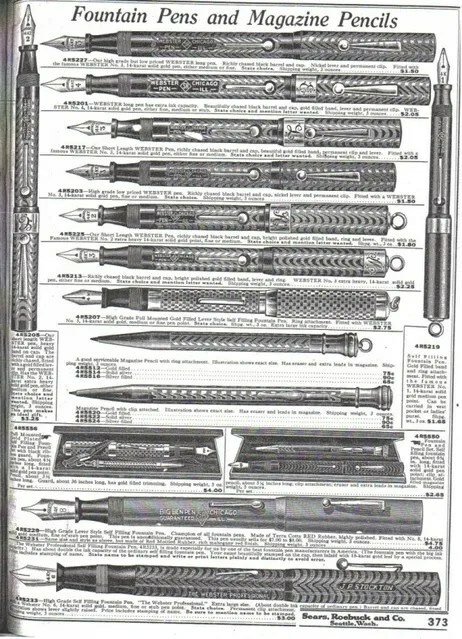 Here is an example of a catalog page with a selection of pens, including Websters from the Spring of 1924. This exact pen is not there, but many BCHR (black chased hard rubber) pens similar to it appear. Additional information on Store Sold Pens appears in a post that I wrote on December 11, 2007. I finally had some time to take this pen apart and it was no easy task. The section was very stubborn and I actually had to walk away from the pen yesterday and come back and try again this evening. Finally, the heat worked and the section came out with no cracks. Here is the result of the extraction of the sac and lever. Both would need to be replaced and I used a new j-bar and size 16 sac. The gold polished up well and the Warranted 4 nib has some flex to it. The restored pen looks quite good and this is a bit surprising to me. The insides of the pen were quite dirty and the sac/pressure bar were a mess, but the exterior trim, rubber chasing, and imprints are almost mint. It must have been stored very carefully for many years. As a collector, I am very thankful for this, and wish it happened more often. Here is a picture if the finished product and side imprint. The SR on the logo stands for Sears and Roebuck. Today’s restoration was a Bankers Coin Filler Pen. I found this one about two years ago on eBay and left it in its original condition. I recently decided to finish the restoration and take a few interesting pictures. When I first came upon the pen, the coin fill feature was the main attraction. These pens are filled by taking a coin and pressing it into the slot in the barrel. This depresses a bar which presses against the sac, compressing it. When the coin is released, the sac fills and the ink releases up into the sac from the bottled ink. In a future post, I will show a matchstick fill pen that simply replaces the coin slot with a round hole into which a hard wooden matchstick fits. This pen is also interesting in that it took me a little time and some outside help to determine a little history behind the pen. When I began researching and asking questions, I received a few pieces of interesting information. First, the address on the pen is One Madison Avenue, New York. A quick search reveals that tis location was built by the Metropolitan Life Insurance Company in 1909 and remained the tallest building in the world until 1913, when it was surpassed by the Woolworth Building. Further information can be found in a New York Times Article here. Back to the pen. 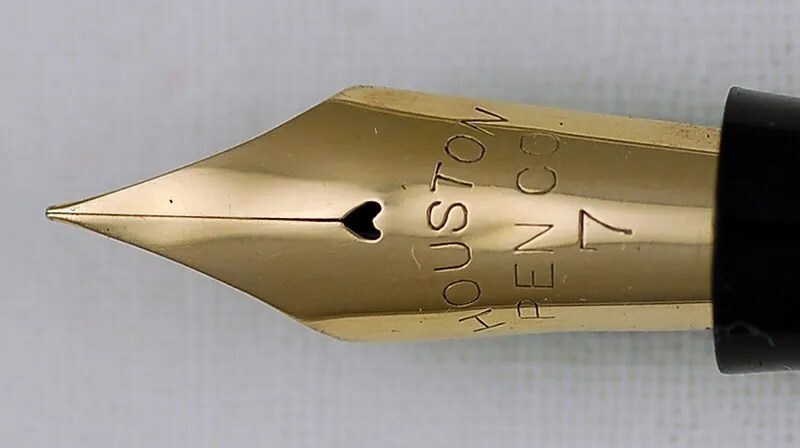 I went to Lion and Pen, on the web, which is a website that specializes in fountain pens and their history and asked if anyone had additional information on this pen. Several responses came back and were extremely helpful to me in determining who might have made this pen and at what point in time. The feed gives a very large clue. Julius Schnell was a pen barrel maker that made barrels for many pen companies, including Sheaffer and Conklin. During testimony in a trial as a witness, he divulged much information about his business, and one such morsel was that he made parts for Bankers near 1911 and forward. The patent for the feed that is pictured below can be found here. So, I feel comfortable in stating that this pen was made with parts provided by Julius Schnell sometime after 1910 in New York. I do not know who made the nib, but as you can see, it is a Bankers No. 2 14K Gold, with a distinctive “heart” hole. 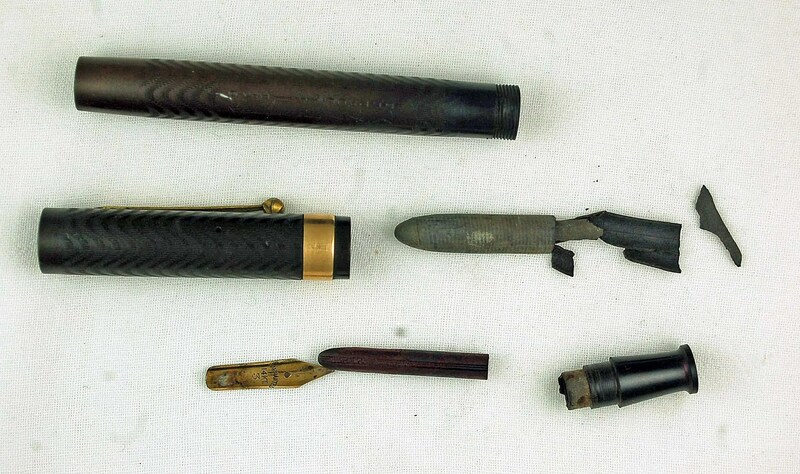 The pressure bars for these pens were most probably made by Duryea of Hackensack, New Jersey. Bankers assembled all of these pieces together and sold them under the Bankers name that appears on the pen. This was not unusual at the time, especially for many of the smaller pen companies. Restoration was easy. I heated the section and removed it from the barrel. I then knocked out the feed (Schnell) and nib and cleaned them off – the feed with water and a good scrub as well as cleaning the channels with a dental pick to clean out any residual ink. The section was cleaned of ink using water and a q-tip. The pressure bar on the inside of the barrel was in good shape and did not need to be replaced. If it had, I would have used a standard size j-bar. A size 16 sac was secured to the section with sac cement and the section/feed/nib assembly was inserted back into the barrel. As you can see from the pictures, the cap and barrel have turned brown from age. This happens to Black Hard Rubber (BHR). The chasing is still quite distinct, but the discoloration is very evident when the cap is removed and the hard rubber that was protected by the cap shows its original black color. There is disagreement in the fountain pen collecting community over whether this discoloration should be reversed when a pen is restored. I chose not to do so with my old hard rubber pens. It should be noted that there are products available and restoration professionals that do provide this service. I feel it is a personal decision and the examples I have seen of reblackened pens are stunning. My only concern would be that any reblackened pens should be disclosed as having had this treatment. Here are a few before and after pictures. The nib has quite a bit of flex to it and I find that the coin that works the best in the slot is a dime. Just always remember to have a few handy. Just a few years short of a century old, this pen is back in “circulation” (I couldn’t resist the coin pun).